On April 22 we arrived off Korcula, the last of our medieval walled cities on the Dalmatian coast. This was a tender port (ie. the ship is anchored and passengers go to and from the port by tender boat) and it was also a short day, with all aboard scheduled for 1:30. But we found this to be more than enough time for this small town, particularly since almost everything in the old city was closed for the off season (sadly, we were about 9 days too early for the start of the season). Korcula is another walled city on a small isthmus with orange terra cotta roofs & has been called a mini-Dubrovnik. This might have been a little more exciting if we had not been to the actual full sized Dubrovnik only 2 days earlier (and it might have been more interesting if the museums had been open and the Cathedral hadn’t been covered in scaffolding). Still, it was an interesting city to explore & we had a pleasant time (except for the cold weather). Unlike many medieval cities, Korcula was built according to plan. It is shaped like a horseshoe crab pointing out from the land. The streets are laid out in a sort of herringbone pattern, with a main road running from the main gate toward the rounded point of the crab & rows of fairly straight side streets branching off at a bit of an angle in each direction. It is said that this plan was designed to protect from the harsh south winds but let in the pleasant north winds. Founded by the Greeks in the 4th Century BC, Korcula was later part of the Roman Empire and later was ruled by Venice for a number of centuries. 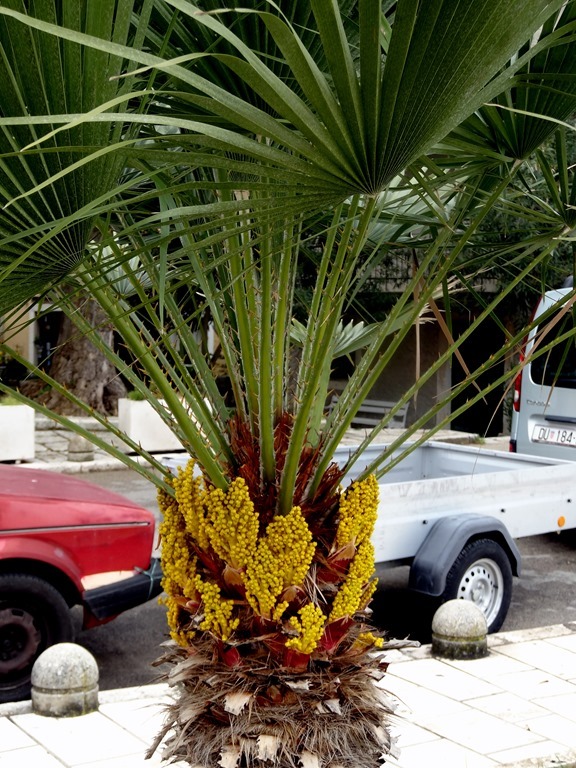 It was part of Yugoslavia after World War I and again after World War II, and is now part of the independent Croatian state. 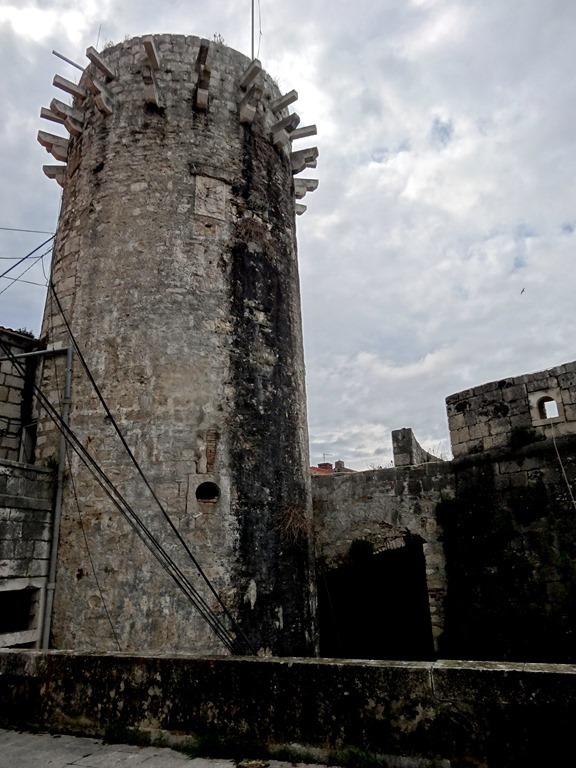 We entered Korcula by the 15th Century Land Gate, an impressive introduction with a grand stone staircase leading over what once was a moat-like canal to a large crenellated tower. This Revelin Tower has a relief of a Venetian lion of St. Mark flanked by the coats of arms of the Doge of Venice on the left and the rector of Korcula on the right. The inside of the gate was more elaborate than the outside & the tower was topped with a picture window (it was closed for offseason, so we couldn’t go up to see the view). To the left of the gate after entering is the 16th Century Rector’s palace, which had a nice loggia and a large stone plaque of the lion of St. Mark leaning against a wall. Nearby was an interesting shrine and on the right was the 14th Century Church of St. Michael. Apparently it was believed that a church dedicated to St. Michael inside the town gates would help ward off enemies. The stone overpass to the left of the church leads to the building of the Brotherhood of St. Michael. We walked on to St. Mark’s Cathedral, the highest point in town. You can see it atop the city looking like a birthday candle on a cake in the first picture. Unfortunately, the cathedral was covered in scaffolding and canvas so we didn’t get to see what it looks like. We went in but no photography was allowed. Across the street is the Gabriellis Palace, which now houses the town museum (closed for offseason, of course). 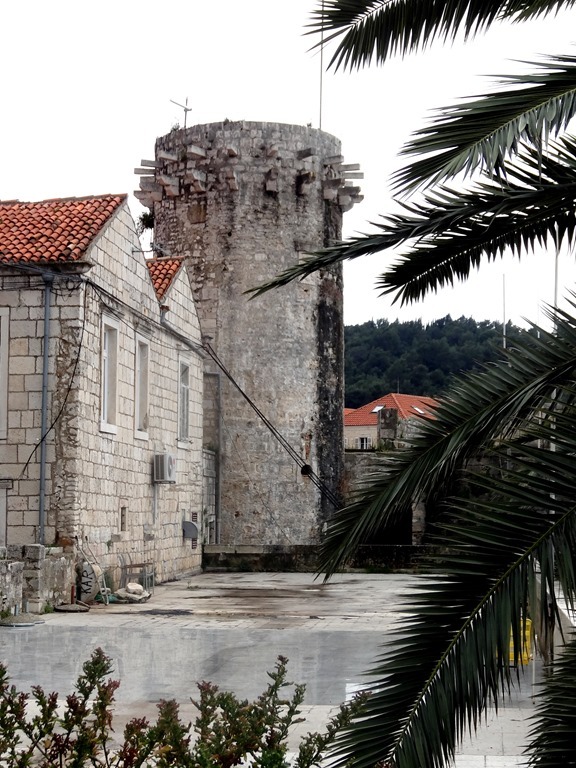 The last real landmark in Korcula is the so-called Marco Polo’s house. Korcula claims the Marco Polo was born here in 1254, but there is no actual evidence that this is true and it is disputed by historians, who seem to think he was most likely born in Venice. As we have seen elsewhere, however, Korcula has a house claimed to be his birthplace (although it was apparently built a little too late for that) for tourists to pay to visit (but not in offseason). It is an imposing tower of a house with some lovely ruins attached, so it is worth seeing if you are in town whether Marco Polo ever lived there or not. Marco Polo does have a documented relation to Korcula, however. In 1298 he was captured by the Genoese in the Battle of Korcula, a sea battle in which he commanded one of the Venetian ships. While he was a prisoner of war in Genoa Marco Polo and another prisoner collaborated on the book about his travels to China that became something of a sensation (although few believed it at the time) and helped inspire Christopher Columbus to try to sail to China almost two centuries later. While its streets aren’t maze-like, they are picturesque as in the other Dalmatian cities: narrow and often with arches and stairs. This is, or at least was, a walled city. The town walls were built at least by the 13th Century, but they were extended and the fortified towers built over the next few centuries by the Venetians (each tower has a plaque of the lion of St. Mark). In the late 19th Century, when the Ottoman threat had long passed and Korcula was no longer a strategic outpost, the Korculans took down the top half of the walls to use for new buildings. But the walls with their massive defensive towers still make a substantial impression. Outside the walls the city is surrounded by mountains, which were largely covered by clouds the day we were there. 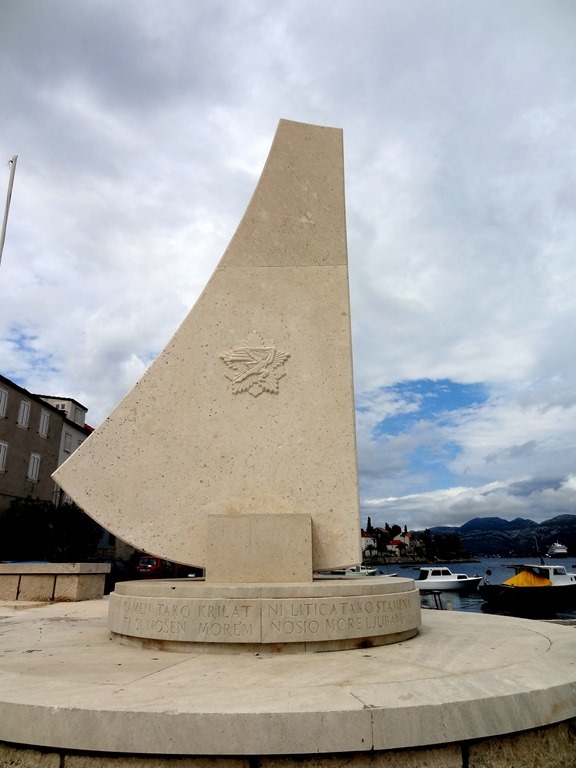 There is also a nice strip of waterfront with palm trees (Korcula is actually further north than New York), boats & an interesting monument with reliefs from the era of Socialist Realism. So that was all for this very short port day, & we returned to the ship. Our friend Jerry (who took the picture of us by the stairway) was returning at the same time and was carrying an expensive SLR camera he had been given by the proprietor of a café where another passenger had left it. An impressive bit of honesty by the proprietor — since no one knew who it belonged to & the ship was getting ready to leave no one would have returned to ask him for it. Jerry did eventually discover the identity of the camera’s owner by pure serendipity (she was standing at the front desk of the ship when Jerry went to turn it in). She was very lucky! Anyway, we sailed away from cloudy & chilly Korcula and the Dalmatian coast to our first stop in Italy, Venice. This entry was posted on June 21, 2013 by Rick. It was filed under Mediterranean cruise . Cute little town. Enjoyed your commentary on your visit. Too bad you couldn’t get into Marco Polo’s house. Even if it wasn’t his house, it would have been interesting. According to Rick Steves, the Marco Polo house is pretty much empty & the view from the tower is “uninspiring.” I was more disappointed in not seeing the Cathedral & some of the museums. Yet another place you have introduced me to. Looks interesting, but not quite in the same league of “must-visits” as some of your very most recent stops. Still, I enjoyed seeing it and reading about it! Well, its certainly not among the highlights on this trip, because it has so many special stops. But I imagine it would be a much more interesting stop in season, when the museums are open, the restaurants & cafes are operating & there are more people around (don’t know if its true, but we were told that a lot of the people who cater to the tourist industry live in New York during the off season). Also, it would have made a difference if the Cathedral hadn’t been covered up & if the weather had been a little better. Its a very interesting looking town, with its gothic & renaissance architecture, & would have benefited from being a bit more lively. Still, its never going to equal Venice or Barcelona or Jerusalem or Alexandria, to name a few.